The sleek, slim line design and white finish of the 5 shelf wide bookcase enable it to co-ordinate easily with a wide range of room styles and decors. 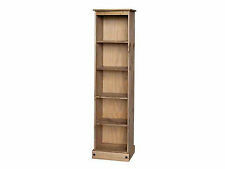 1 x Bookcase with 5 shelves,colour: Oak. 24 cm storage depth. Contour 5-Tier Display Glass Shelving Rack/DVD Storage Unit/Black-GR08B. All specifications noted are manufacturer specifications & are subject to change without notice. Only orders that have not yet been dispatched can be cancelled. This tall and wide bookcase from Maine collection is perfect for displaying books and other decorative. It smart design doesn't take a lot of space in our living room but provides you with large amount of storage space. Virtually New Very Little Used WOODEN IKEA SHELF UNIT. Condition is Used. Collection in person only. Retro Hanging House Wall Shelf Wow your guests with this uniquely designed wall shelving unit whilst displaying or storing all your favourite things. Can be used as a practical or display piece and will fit into any room around the home but would look especially funky in a little girls bedroom, modern bathroom or study. 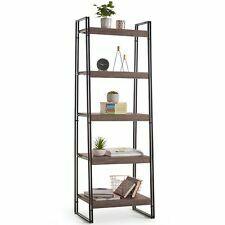 Wherever you decide to hang this unique shelving unit you are sure to be pleased with the outcome or why not gift it to a friend or loved one. Colour - Black Material - Powder Coated Steel Dimensions: Height- 50cm Width of 4 Shelves- 32cm Width of Roof- 50cm Length of Each Shelf- 17.5cm. Lacquered MDF Solid Construction. Easy Self Assembly. Quick Code: LADDERWHT White Ladder. 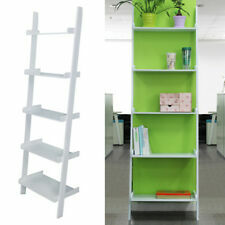 Ladder White Shelf Unit. Big Furniture Warehouse. © Big Furniture Warehouse. Size = (W) 54cm (D) 36cm (H) 178cm. 5 Tier Shelving Rack - Narrow Tall Garage Storage Shelf Office Shed Utility Room. Simple to assemble in just a few minutes – no tools required. 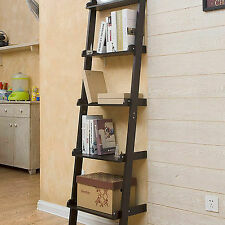 Includes two free wall brackets, allowing you to fix shelving to the wall safely. Item Description This very strong 5 Tier Boltless Racking Shelf is a must for every household! Whether you are looking to store tools, food, books, clothes or even paint tins, this is the ideal solution. It has a load capacity of 65kg per shelf (evenly distributed) giving a total loading capacity of 325Kg. The frame is made from heavy duty steel and has been powder coated to give it the extra special look. It comes complete with cut-to-size 6.8mm MDF boards. Please be aware other suppliers supply inferior chipboard shelves which are less strong and they tends to absorb moisture in the air. The shelves can be adjusted to also fit a variety of items. The shelf is ideal for sheds and garages and stands alone for the perfect way of storing and giving you the space you need. Versatile ✓ This storage shelf is suitable for a large field of applications: Wether in kitchen, bathroom, livingroom, hallway, as an airing cupboard, display, towel, DVD, shoe or spice rack! Stylish ✓ The shelving unit is made from natural wood and finished with a brown glaze, which makes it especially easy to care for and adds a pleasant and appealing appearance to it. Spacious ✓ The 5 tiers with slatted design provide a large storage capacity to accomodate anything you want to organise. Dimensions (HxDxW) 135.5 x 26 x 57 cm / 53 x 10 x 22.5 Inch. Easy assembly ✓ The flat pack includes all assembly material and parts. 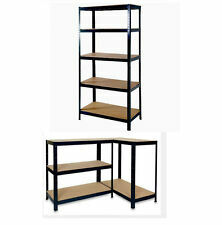 5 Tier Bookcase: Width: 90cm x Height: 180cm x Depth: 25cm. Combine the two or more bookcases to create a large feature wall unit; or create a clear distinction between two sections of one room by having a bookcase on either wall. Stylish bookcase. Ladder Style Wall Rack - Grey. Grey design. We reserve the right to repair or replace products at our discretion. Height: 189cm. Depth: 56cm. Width: 32.5cm. This is a "Signed-for" service. 1 x Bookcase. - Colour: Maple Color. An extensible, flexible shelving, which impresses with plenty of storage space and a linear, modern look! - Board thickness：1.2CM. - Assembly instructions. Due to the the inevitable differences in monitor type and setting, Colors on your computer monitor may slightly differ from actual product colors. 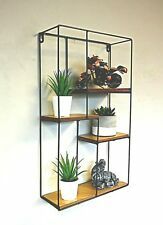 Industrial House Shaped Wall Hanging Shelf This sturdy urban style home storage accessory will provide a great storage or display stand for all your bathroom essentials like lotions, make up and more or why not use is to display potted plants or other nic nacs. Buy More than 1 and hang several units horizontally or vertically down your wall for an even more dramatic effect. Wow your guests with this uniquely designed shelving unit whilst displaying or storing all your favourite things. Can be used as a practical or display piece and will fit into any room around the home but would look especially funky in a littles girls bedroom- let her decorate it with all her dolls and accessories, modern bathroom or a study. Wooden bookcase used but good condition 5 Shelves , 2 Drawers 6 Ft Approx in height. Condition is Used. The sleek, slim line design and white finish of the 5 shelf wide bookcase bookshelf enable it to co-ordinate easily with a wide range of room styles and decors. 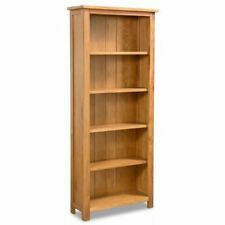 1 x Bookcase with 5 shelves, colour: Oak. Free UK Delivery!!! Brand New In Box!!! 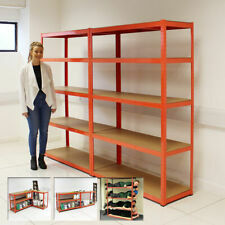 A modern and unique unit ideal for as shelving or storage. The shelves are separated by chrome pillars Giving it a nice contrast and look. There's ample storage space between them to house Anything from digital boxes to Dvds ,books and more . Materials: White Gloss finish mdf , chrome Dimensions: H165cm : W60cm : D35cm . This5 Tier Wooden Shoe Rack has various possibilities of usage convinces by its simple elegance slatted design. Also it is thinkable as a storage for your household utensils. 5 Tier Wooden Shoe Rack Specifications. A simple unit can be enough storage for a limited space or the foundation for a larger storage solution if your needs change. This modern bookcase brings a chic style while the open shelves allow you to easily display all of your books, photos and other treasures. Reclaimed Scaffold Board Shelving Unit The unit is made with 42mm galvanised tubing and clamps with reclaimed scaffold boards and each shelf is fully adjustable. Each board varies in appearance which adds to the effect of the unit. The boards are heavily sanded and varnished. We are able to make to order altering the number of shelves, wall or floor mounts and side fittings. The units can be broken down for transportation but they are heavy. Please do not hesitate to contact us if you have any questions. This very strong 5 Tier Boltless Racking Shelf is a must for every household! The shelf is ideal for sheds and garages and stands alone for the perfect way of storing and giving you the space you need. Easy to assemble and very strong. Perfect for storage in house or warehouse. (design may vary slightly) can collect from Manchester if you want they may be assembled. 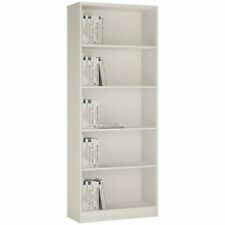 'Tvilum' White Bookcase Wide Cabinet, Adjustable Shelves. Tvilum White Bookcase / Shelving. This Charming Felix Bookcase Provides All You Need From A Bookcase. with Adjustable Shelves. 1 Fixed & 3 Adjustable Shelves Allow You To Get The. 175cm Height. 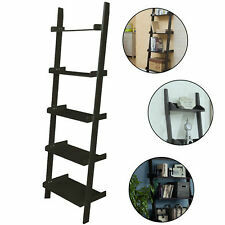 Wooden Tall 5 Tier Bookcase Shelving Display Shelves Storage Magzine Rack New. The sleek, slim line design and white finish of the 5 shelf wide bookcase bookshelf enable it to co-ordinate easily with a wide range of room styles and decors.